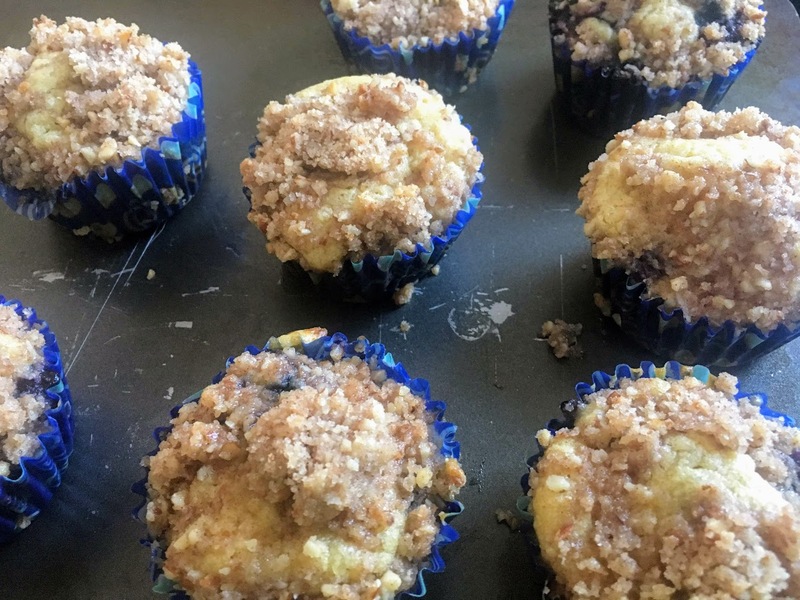 I took my favorite buttermilk muffin recipe, from the cookbook Clueless Baker by Evelyn Raab, and added almond extract, fresh blueberries, and a crumb topping adapted from a recipe by Tutti Dolci. In place of store-bought buttermilk, I stirred together milk and lemon juice, and let the mixture turn acidic and curdle. 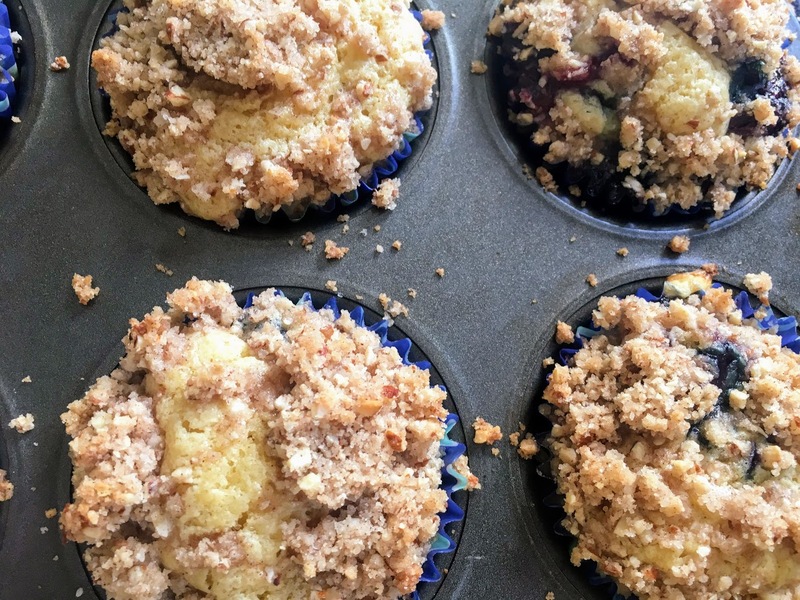 Buttermilk lends tanginess and moisture, and the almond streusel adds crunch and a burst of sweetness to these otherwise not-too-sweet muffins (the crumb topping is my favorite part!) The original crumb recipe calls for sliced almonds, but I finely chopped the almonds in a food processor for added texture. Serve these for breakfast or a snack, or pack them along on a summertime picnic. Note: to prepare buttermilk at home, combine one cup of milk with one tablespoon of freshly squeezed lemon juice or vinegar, and let sit for around 15 minutes, until the milk starts to curdle. Prepare the crumb topping: Preheat oven to 425 degrees and line two 12-cup muffin tins with paper liners. In a medium mixing bowl, or in the bowl of a small food processor, mix melted butter, sugar, cinnamon, salt, almond extract, almonds, and flour until just combined. Set aside. Prepare the muffins: In a small mixing bowl, combine flour, sugar, baking, powder, baking soda, and salt. Melt butter, and set aside to cool. In a large bowl, whisk eggs, vanilla, almond extract, and melted, cooled butter until smooth. Add half the flour mixture, stirring until just combined, then add half the buttermilk. Repeat with remaining flour mixture and buttermilk. Assemble and bake: Spoon batter into prepared muffin tins, filling each cup three quarters to the top. Sprinkle evenly with crumb topping. Bake for 5 minutes, then lower temperature to 350 degrees. Bake another 10-12 minutes, until muffins are golden brown and a toothpick inserted in the middle comes out clean. Store at room temperature in an airtight container for several days.